I just wanted to get these posted up real quick so I wouldn't forget. 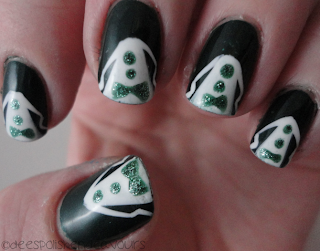 I was going to go with some Shamrock nails again, just like last year.. BUT.. We are also celebrating one of my good friend's birthday tonight as well (her birthday (today) is seriously a great fit for her!!) - so I decided to do tuxedo nails green-style. No, I don't feel I did that great of a job.. They are kind of rushed.. But I will try these gems again some time and do a much, much better job! 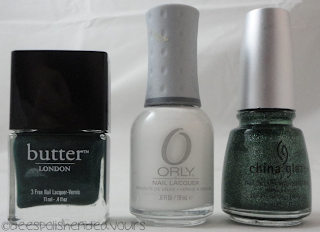 I used Butter London British Racing Green, Orly White Out, and China Glaze Mistletoe Kisses.